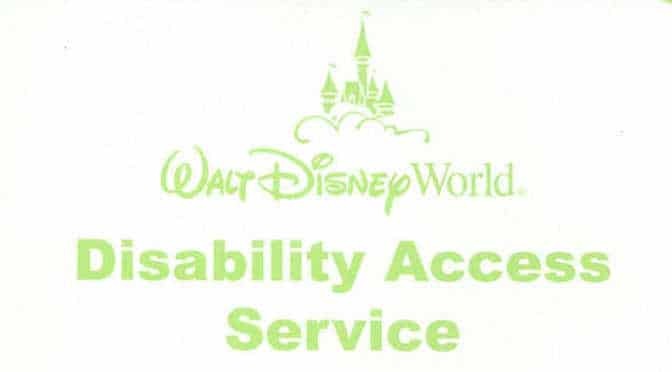 Beginning Monday, April 27, 2015 the current Disability Access Service (DAS) that is currently in place to assist guests will be changing. The system will move away from the typical paper cards and time stamps to using the park-wide digital system. In an effort to help guests have as fair experience as possible while using this current system, the resort is moving to using Magic Bands or RFID enable tickets to assign return times for the DAS system instead of using the familiar paper cards. While the functionality of the system will change, the policies of the system will not change. This system isn’t intended for guests who want to avoid waiting in lines, but to assist those who truly need extra assistance. This system may also be used in conjunction with the current Fastpass+ system. Walt Disney World actually encourages you to do this. DAS users will still be granted 3 Fastpass+ and can continue booking subsequent Fastpasses in the park while they are available. Visit Guest Relations at the first park you plan to visit. The primary guest(s) using the DAS system will still need to have a photo taken that will be linked to their MagicBand or park ticket and those of their guests. Guests will be asked for their party size. You’ll be limited to that number when you return later using the DAS. The maximum number of guests per DAS user will remain 6 per user. One major change for the new digital version is a 60 day term of usage. This will apply to all users. The photo linked to a MagicBand will be valid for one year. Visit an Attraction to schedule a reservation return time. After setting up your DAS registration, proceed to an attraction of your choosing. Visit the regular stand by (not Fastpass+ entrance) Cast Member. The Cast Member will scan the MagicBand or ticket of one member of the party. ANY member of the party may take care of booking a DAS visit. The guest with the disability does not need to be present when making the initial reservation, but must be present when riding. All guests are not required to ride though. After the Cast Member scans your MagicBand or ticket the DAS system will automatically assign you a return time. The return time will be the current posted wait time at the attraction minus 10 minutes. If the current wait is 75 minutes, the DAS return time will be 65 minutes later. The DAS user and guests may return ANY TIME after that return time all the way up to the closing of the attraction. However, you may only have ONE DAS reservation at a time. (Think of it as a 4th Fastpass+ for terms of discussion.) If you attempt to get another while one is still active, it will over write the previous reservation. Jot down the return time! It may help you to add it to your phone or jot it on a piece of paper. You will be able to view the DAS return time on My Disney Experience or an in park kiosk, but you will not be able to adjust the time! Do something during the waiting period. You can walk around, visit another attraction, meet a character, use your Fastpass+, go shopping, sit on a bench etc… It’s up to you to determine what to do while you wait for that return time! Use the DAS reservation. Remember, the original user who registered for the Disability Access System MUST be present at the ride. If the DAS user does not wish to ride, no member of the party will be allowed to ride, so choose the rides that the DAS USER wishes to experience. The user and his/her guests will present themselves at the Fastpass+ return line, scan their MagicBand or ticket and walk on into the experience. Cast Members at the ride will assist with any special vehicle needs. When a DAS user or his/her guests tap their MagicBand or ticket, it will always light up blue, but that merely to tell the Cast Member to review the DAS reservation and party members before proceeding through the Mickey touch point. My father used the current DAS system a couple months back and found it really helped him experience more of the park when it was combined with Fastpass+ usage. The paper card seemed pretty easy to use, but everything is moving digital these days, so we all adapt and move forward. Be sure to pass the word along. Great article! We have never needed to use this before but we are going with a large group of 18 family members. 2 will need DAS. We will not all be together all the time and sometimes the DAS holders will be with different family members so what is the best way to handle that? Thanks! There were 8 of us and they made an exception because we were all one family. Ugh, so the limit per DAS is 6? Have you heard of them making an exception? My husband and I have 10 children. One of our daughters will be able to get this pass…she has severe quad Cerebral Palsy. With our large family, I would hate to split up us up all the time as we already have to do that often. Speak to Guest Services and explain your situation and see what they can do to assist you. Can you show up at guest relations for das a day before going to the park and do registration process to avoid doing it when gates open? I believe there are locations outside of the main gate. What is all the fuss about the DASP ?? I’ve used it with my granddaughter and it works fairly. We get a return time and go eat lunch, or go ride a FP ride. This is fair to the disabled and to everyone else. You do need to wait a short time to ride but this should be expected. You just have to plan your day and use you DASP wisely. We are taking our kids to DisneyWorld for the first time this fall. I’m really confused as to how this system will work with our family dynamics. With two parents and two children – three will require scooters – all four have multiple disabilities. The park info says if you just need a scooter/wheelchair then you won’t need a DAS, but our situation isn’t just needing the scooters. Do we all get DAS passes? how do we get to go with a family member on one ride while another family member rides something else with another family member? If i want to use my DAS for something I can ride (which are more limited), but my son doesn’t want to do that and wants to use his DAS for another ride… it doesn’t sound like that can happen. ?? If ride has DAS for rider 3 but by the time we get to ride then rider 3 is unable to ride … then no one gets to ride… even after the waiting and the fact that other members are also disabled? Are you limited in how many DAS rides you can do? I see that you can only have one ‘ride time’ at a time but after that you can go get another one? and another? as long as it’s one at a time? My mind is swirling with just the fastpass info and then this – I am so confused? (maybe im too old for all this now) Is there an advantage to DAS? if its like an extra fastpass? I haven’t been to a theme park since the 90s. At that time I was the only one needing a wheelchair. Now, its a lot different. My kids have never been to Disney World and they have never even been on a family vacation. This is going to be a once in a lifetime event. We won’t be able to go again and I want things to be… magical… for them. I want things to go smoothly. I’ve been trying to find out everything i can to try to resolve any issues before we get there. Family dynamics are SO different now. I just found your site a few days ago so I haven’t seen everything on here yet… but do you have suggestions on things that are doable during a DAS wait time? I guess im picturing in my mind getting a return time and sitting and sitting, ride for 5 min, get another time and sit some more. i know that’s almost like ‘standing in line’, but our time in the park will likely be much shorter than the ‘average’ person, meaning we would have less time to see or do things and I want them to experience as much as possible. The DW info says they can’t help you with the DAS until you are there. On another FB page for DW fans they said the same thing (DW wouldn’t give any specific information before arrival at the park) and then when they got there they had problems. The more info I can gather prior to arriving the less time we will spend trying to figure it out when we get there. Thank you for this site. I’ve already saw tons of info that I think will be helpful for our planning. Any info would be greatly appreciated. Your situation is definitely more complicated than most. We have 2 adults and 2 adult children (both children entitled to a DASC). We visited WDW at Xmas and utilized the DASC and Fastpasses so hopefully I can give you some insight into how to make it work for your family. First off, yes you can only sort out the DASC’s once you get to WDW – go to City Hall at Magic Kingdom and fully explain your situation to a cast member and they will sort out what they can for you. They will take a photo of each person and load it on your ticket/magicband along with the DASC. Anyone just needing a mobility scooter will NOT get a DASC but if there are multiple disabilities you will get a DASC per person. If you get a DASC per person, leave it at that and DO NOT load your family into a ‘party’ as that will complicate how you can get return times for rides. If you each have a DASC then you can all go to whatever ride, get a return time each and then go back – yes, you can only have one return time but as soon as that is done then you can go and get another one. The only trouble will be that you will ALL have to go and get a return time. If one of you does not get a DASC then you should link that person to the one that they ride with the most. Preloading fastpasses on your ticket will prove to be the best idea for you. If you load up 3 rides for each day for each person then you are only using the DASC’s as ‘bonus’ rides and your day will not be as nervewracking. Thanks so much Carol! That helped a lot. Made more sense too. That actually breaks Federal law and could lead to lawsuits. MagicBand wouldn’t work? It’s not connected to wifi. I don’t see wide spread abuse with this newer policy. I think that sounds like a good system. Like you said they don’t have to name the disability but just state that the person can not stand in a regular line and wait. Thanks for all of your advice Kenny. Traveling with my sister in law who has MS and can walk short distances slowly without falling. As Disney requires a lot of walking, she will be using a wheelchair for most of the trip. I appreciate you taking the time to explain what we can expect. Thank you for including this on your page. I have a son with cerebral palsy and knowing the seating layout/restraint type is VERY helpful. The best solution would be make the person, wait the time posted for the wait. To many people are using this as a fast pass. I know this is not a popular point of view. But in all fairness its not right that someone has to wait an hour for small world when others only have to wait 5-10 minutes. That’s not how it works. DAS still requires you to wait as much as the posted wait, just not in line. You have absolutely no idea what you’re talking about. Did you read the article at all? That is not how it works. Be thankful your able to wait an hour, some people are not that fortunate…… I have used this system for my daughter and its a vacation saver. Since our party of 4 all have disabilities I plan to get DAS for all of us so we don’t have to worry about being linked to one person or another when riding as not all will be able to ride certain rides. 1- When we go to the first park we can get the DAS and it is good for all parks and we don’t have to do it again at each park – correct? 2- how long will it take to get the DAS? 3- as there are multiple disabilities/health issues for each member- when filling out forms will I need diagnoses? List needed accommodations? Or what.? I want to have everything written out so I can just copy it onto forms to speed up the process. Things are just ‘normal’ for is at home and I don’t think about every possible situation we might encounter in an amusement park – especially since we have never all been to one before. 4- is there a lot of shade at DW? 3. I never had to fill out diagnosis for my father. One DAS will handle your family too. 4. There are a lot of shade trees in the parks, but some things are in sun too. Question. Can we also use DAS for the characthers? And for all? Just not only those with fastpass+? I have the dlrp version of the DAS and there I’m allowed to go to the exit of the charaters meeting spot and wait there for a return time or wait a couple of minutes for getting to the character. Or ask the cm thats with charachters thats are wandering around to help me to get a picture by pulling the character out of the mob of other visitors so I’m able to meet and greet in a quit way. How is this in WDW? I’m going in a few months with family that includes my autistic son. We’ve been before, but didn’t even know about the DAS, so it’s good we know about it this time. Shame there’s no way to use it at the water parks. At least some queues at MK et all have shade or things to look at/do. Water park queues are often in full sun with nothing to do (hands on stuff). Kenny, I have a question I can’t find an answer to. We have an autistic child whom we have gotten DAS card for during our last visit. It was very helpful to wait somewhere other than the line. He does not like to be touched and tends to flap and spin while waiting. We want to plan an end of October early November trip to attend both parties. I know there is no Fastpass at parties, so is there DAS? I know you have said the lines are shorter, but 20 min. with my child flapping or on the ground bumping in to people sounds stressful for all. Just debating whether this is feasible. Thanks for everything. Love your site and character locator! One of the adults travelling with your daughter should be able to sort out her DAS for her at guest services. If she is able to get herself to guest services, wait in line and then sort out the pass all by herself, then she probably isn’t eligible for a pass anyway. Does the person obtaining the service need to be over 18? My daughter (15 yrs. old) needs a DAS and is going on a school trip to Magic Kingdom; however I will not be there with her. Will she still be able to obtain the DAS for herself? I am in the same situation so emailled Disney. When you get to Guest Services put both kids on all your MagicBands as DASC – you should then be able to take a kid each and use the DASC as usual – it will just be more time consuming at each ride as you will have to tell the CM know which kid and which adult are riding. You are 100% incorrect. Each person can be on multiple DAS, but no person can have more than one return time at a time. Example: 2 parents, 2 kids, each kid has a DAS. Each DAS would have mom, dad, and both kids. Scenario 1: Kid #1 wants to ride Space Mountain with mom, kid #2 wants to ride Buzz Lightyear with dad. Kid #1 and mom go to SM to obtain a return time…they will be asked who is going on the ride. Kid #1 and mom would be given a return time for SM. Kid #2 and dad go to Buzz, and it’s the same process. Scenario 2: All four family members want to ride 7DMT. Same process as above, but all members of the family would be given a single return time on a single DAS, either kid #1’s DAS or kid #2’s DAS. Risk here is that if the DAS holder chooses not to ride, no one rides. DoneInMichigan is correct, that is exactly how it works. Each person can be on multiple DAS. This was a vacation saver when we had to split up for various reasons now and then! The Americans with Disabilities act prevents us from even saying your child needs a first floor room because he broke his leg, much less anything else. People with disabilities have to be treated like anyone else, for good or for bad. We are not allowed to even mention a disability. Thank you for your information – only board I have seen that spells this policy out & how to use it. We’re taking our handicapped daughter to WDW this fall & were unsure of just how to proceed. FP+ in advance yes/no just a DP or???? Now we have a clear picture – thank you so much…..
We just got back and the new system worked great. We would use it as a fourth fast pass. Basically we would get a time for the ride as soon as we got there. Everyone CM was super helpful and extremely nice. I was pleasantly surprised that it worked so well. I had heard so many negatives they I would like to say in really wasn’t bad at all! Our family have been going to Disneyland and Disneyworld for over 30 years. Our first 3 children did not have disabilities. We went at crowded times… slow times.. had a great time.. New years eve was the best… I remember running to ride to ride because the park was going to close… wonderful memories…. We wanted more children so we decided to adopt… We adopted 6 children… 3 first… than 3 years later… 3 more..All with disabilities. Never knew there was help until a very nice cast member asked us if we knew about the GAC card. no… so we went to the town hall with the first 3 children we adopted. Disabilities were… MS… cerebral palsy… 1 in a wheelchair… We would stand in line and a cast member would tell us where we were suppose to go…. Than we adopted 3 more… with more serious disabilites …… our 6 year old, was missing part of her brain, deaf, her organs were reversed.. lung issues on oxygen received a Make a wish…. that was so special… our 10 year old has club feet, fetal alcohol syndrome, cerebral palsy, MR, and 2 holes in her heart. Our youngest is deaf, uses a feeding tube, has Cerebral palsy and MR. All in wheelchair/strollers. We used the GAC card no issues…. Than in November 2015 WE took 5 of the Children to Disney World… thats when the nightmare began. Mind u I called before going to have them explain the DAC card… they told me our case is different… and to bring the Make a wish letter… and doctors letters… and we would just tell the cast member at the town hall our childrens disabilities. WE explained that one child was on oxygen. and so on …… it wasn’t private.. I explained we only had a window of time we could stay at the park… 3 still wore diapers… one needed suction…. But please understand… the joy each child experienced before the DAC card was priceless… Christina the former make a wish child loves It’s a small world.. Deaf and only weighing 40 pounds and only 40 inches tall, fell in love with the ride.. she doesnt talk.. but she would clap her hands with joy…. Anna could spend her time meeting the princesses and going on Splash Mountian…. the other children were just amazed at all the wonders of Disney.. the kindness of staff… meeting Goofy… I get it that people abused the system… we did not… for our children its not about them getting upset that they have to wait an hour for a ride… we have done that with our children without disabilities…. its about the fact that we have a small window of time we can get to the rides…. but each ride brings such joy to them… We can only stay a few hours at a time… they need to be suctioned and giving oxygen…. we do not have children that will act out because they have to wait…. it’s about the time they have to make them smile…. there is a difference I have noticed in the cast members… they use to come up to our children and interact with them…. smile.. give them a pin… I feel that the cast members feel bad that they have to say come back an a hour than wait in the fast pass line for another 20 minutes to get on….. I sense a feeling of sadness from them… I love disney… they have brought my children such joy…. I’m sorry if u don’t understand that 2 rides on It’s a small world for Christina and spin on the tea cups makes her life a lot more meaningful….. We will try and make it work…..I just wanted to let u know a different side of our love for our children and the love Disney brought to them… this is not about our children breaking down with tantrums…. 3 have life threatning illnesses…. not looking for sympathy… we choose this life….. Disney gave our children such joy…. to watch Anna break down and cry when she met Cinderella was priceless…Melissa who has MS and CP could ride tower of terror and laugh like I never have heard her do… I wish there was an easy answer to make the system work…. but I don’t see one….to many people abused a fare system…. take care…. I was in the Magic Kingdom yesterday. There is a cast member posted at each ride with a portable scanner. They scanned my magic band and asked me who all was riding with my son who is disabled and linked our group which was 4. It took a while for it to work. Not sure if they are still trying to figure out how to navigate the contraption or if the system was slow but each time someone requested a time it had to reset and reloaded. It definitely took longer than when they just wrote a time and stamped it. What happens if their machine quits working or the system is down? Will they then give us a paper card with a return time? I just hope they improve on the lag time because not only was there a wait for standby and a wait for fast pass but there was a little line forming at a couple of the rides as well for DAC holders. Kinda messy but after they scanned it I had no problem. I came back at the time I was given and my family and I went through just fine. What I didn’t like is that the cast members kept saying “when you come back make sure the disabled person scans their band first.” I mean really?? Can we not label them as the disabled please?? I’m sure they taught you better ways of communicating. No they don’t. You can offer it. They cannot require it by law. Would be easier if they would. I work in FP and send people with notes all the time anyways. Totally agree with Kenny. This is not the forum to complain. He is just providing the facts. Other forums (ie dis boards) have had to shut down threads because this is such a hot button topic. Personally I agree with you. But this is a site for information. And Kenny does a fantastic job. I have friends going to Disney for the first time who have no clue about anything so I simply gave them this website! DMV is acting in an official capacity which complies with state laws regarding what qualifies a person to use disabled parking. Theme parks have no authority nor need to ask for private medical information. Could you please try to understand the DAS system has been unfair towards those with disabilities, and Melinda has more than enough reason to be angry, and yes, yell? Having disabled people have to prove they’re disabled after years of having to beg and plead for help because they don’t look like someone who needs it isn’t fair. Telling disabled people to run around the park making appointments for themselves and their families, causing them to feel burdensome and guilty isn’t fair. Disney should have at least taken some input or learned about the psychological experiences of disabled people before putting this program together. Many disabled people have trauma related to being bullied for making others have to wait or inconvenience themselves for them, and being denied help. When I mean trauma I mean I have a legit diagnosis of C-PTSD based on both those issues. Disney now expects those with disabilities to do far more than those without disabilities to enjoy their vacation. How is that fair? I’m a very understanding person. Just don’t value screaming on my website. Write email to Disney. I just report the news, I didn’t create it. I am grateful that theme parks make extra attempts to accommodate special needs guests. I still disagree that it is far worse. You are getting a 4th fp that can be used most of the day at your convenience. It is very helpful to many guests. They require a Doctors note with your condition to get a pass. That is incorrect. 10 minute posted wait time or less will result in waiting in the stand by line. There is no immediate boarding, especially not at 20 minutes. Agree in general but for some this will not work as well. Our family of four used to split up as BOTH our children had DASC cards and go on completely different rides (both can’t wait in line, one is petrified of the dark, one loves rollercoasters, the other hates anything that goes fast – you get the gist). This system now means we can only have ONE DASC ride on our magicbands at one time combined for both kids – so this will affect the way we have to navigate each park. There seems to be some fuss here. Kenny is being good enough to answer our questions and provide some of his experiences with DAS. The DAS was never meant for people to jump the line and get more rides in. It’s there to provide some help, a service to those who may have trouble waiting in line. The individual need of the person using it may or may not be obvious. Will some people try to take advantage, probably, but this is a service that is a help to many, young and old. Thanks for always answering our questions Kenny. Total discrimination here!!! Telling guests with disabilities to “walk around or do something else” while they wait is ridiculous!!!! The whole point of the pass was to hel assist families who had trouble waiting in line or had a disability!! There are many “invisible illnesses & disabilities” so to assume people are faking is appalling!!! What about the people whose illness or disability prevents them frm waiting in the long lines in the hot sun??? How does doing ” something else or walking around” help them??? So frustrated that Disney has given in to fairness for the majority and made it unfair for the minority!!! The cards use to work!! Too bad Disney cares more about keeping the liars from getting into the disabled line than the disabled!!! Can we relax with all the screaming? The old GAC wasn’t meant to get you on the ride faster. It specifically said that. It was to offer “an alternate waiting place”. The new DAS card does precisely that. It lets you wait wherever you want. I believe that is hard because some people actually do need it but do not have a doctors note or have a handicap card such as myself who needed to get a scooter due to the fact I was pregnant with twins and found that walking for a very long time made my feet swell considerably so I got a cart so I did not have to do so much walking. I did not get one for every park mostly just Epcot because there was so much walking to do there. I think people just need to be good people and stop abusing things that are there for people who really need it. But sadly we live in a world where people like to cut corners, be dishonest, and abuse systems that are there to help people who really need it. It is very sad and I feel for Disney because they get so much backlash when in turn they are just trying to find a solution to get these services to people who really need it and get rid of these people who abuse it but its hard because there are disabilities that are easily seen and then there are ones that are not so how do you tell if people are lying or not. My son is Autistic and we are going to Disney this year but I will not be applying for this DAS system unless I absolutely need it which I may, but I will not know until I try it first with him which I want to do but if he is overwhelmed by the lines and we cant seem to get everything done with just fast passes then I will go that route to make him more comfortable because of his disability. Not every child that is Autistic though can do this its all based on the child and how far you can push them where in my case he may be good for the first part of the day but towards the end we may find it wont work but there are other children out there that absolutely can not stand in lines at all so how does Disney tell the difference and how do you accuse someone whether their child is or is not Autistic as some I heard are using this excuse and their child is not even Autistic or has any disability at all. So then you ask people that have a disability to bring a note further having them to call their doctors, get a note, and make sure you bring it with you and not to forget it which I am sure they don’t want to make things already so much more difficult for people with disability. It’s just sad that people use this as a lie because there are parents/people that wish they did not even have to use the DAS system at all but have to because of their disability. Disney doesn’t require any type of proof. Just your word. You are welcome to bring a note, but they aren’t supposed to request one. You weren’t really allowed to split before. The user had to present the card at the gate of the attraction before boarding. Not really anything different, just digital now. Yes thats how you would do it! With the paper card they would just scan the QR code and update the card right away so i guess with the digital one it will be even easier for you to get that number changed. Was wondering how your Disney trip went. Did it work out ok? If those who get a scooter for no true reason have the same line experience I had they won’t get any real benefit from this. I had to rent a scooter in WDW last March after I got sick on our first day and again at DL in Dec a month post-surgery. At WDW there were almost no “benefits” to using the scooter. I still waited in lines, used FP+ etc. for 95+% of the lines. Instead I feel like I missed out on part of my trip as I felt Iike I was in my own “bubble” with my girls (then 3 and 11) always behind or in front of me instead of really “with” me. At DL the older lines that aren’t ADA style were operated much like the DAS. Early in the day I would use the exits (probably the 10-20 minute rule mentioned in here somewhere), but once lines picked up I was given return times. I think there are some who still do the scooter not realizing it’s not a line-skipper any more. Wheelchairs and scooters have never been much of a line skipper. Some attractions offer alternate entrance, but not many. That does not violate the law. HIPAA does not apply to WDW. The DMV asks for a signed form from a doctor to get a placard. That practice doesn’t break the law and reduces fraud. Presenting documentation at the park would achieve the same thing. I would gladly do it for my child, even though is he is very obviously disabled. What works for your dad’s legitimate disability might not work for my son’s legitimate disability? Of that all disability is the same. Or do you speak for everyone? Might want to consider what you are writing as you write it. Might want to read what I wrote. I didn’t make any blanket statements. I just mentioned that my father has a legitimate reason for needing this service beyond wheelchair usage. Rudeness isn’t appreciated on this website. I hear what you’re saying Kenny. But your father is an adult and knows how to be patient. Some of our children with special needs have a very difficult time waiting. Especially long periods of time in the heat, not to mention the anticipation of the ride itself. It can be an absolute nightmare for us. Not thinking this will work for us at all. :( We’ve been to Disney multiple times on the old system. We all had a great time, and they were extremely accommodating! We are very grateful for the past experiences we’ve had. We were planning to head back next year. We’ll have to really think about it though. It will be a completely different experience and I’m not sure my son can handle it. I understand they had to make some changes because of all the abuses. It’s a shame there are people out there who abuse and take advantage of the kindness of others. Because my father is an adult is irrelevant to the discussion of using a valid system in a valid way. Just use the system that is offered to your family and combine it with Fastpass usage. source: im an attractions CM. When We went last May you where allowed to have your pass for up to 8 people. When did that go back down to 6. We are traveling to Disney in 3 weeks with a party of 8 including the person who requires the pass. Just reported the news :) What the official number is and what the Cast Members allow could be different. What a bunch of b.s. to make it fair for everyone. Is it fair that you may have been born with a disability? is it fair that you may have been disabled and now have to deal with it? It’s always about money if you have enough you can pay to have a special Disney experience. You are walked through the fast pass line on EVERY ride no wait! As always the needs of the people who need the most help are walked on by the many! My father has a legitimate disability and he had a terrific time with us at Walt Disney World. Having a disability doesn’t equal back gate at every attraction. The former system was abused badly due to people trying things like that. I am a member of some FB disney groups and I am hearing complaints that people who get scooters are not really disabled -they are actually telling our group members. This makes it more difficult for those of us who are truly disabled. Will WDW Ever start asking guests to see their handicapped placards or a drs note in ordèr to stop people from abusing the use of scooters? No, because it would break the law. There is no way you can know a person on a scooter needs it or not. My father uses a scooter and can only walk a few feet before becoming exhausted. Be careful that we don’t judge someone’s disability based on appearance. I went in November, and had injured my knee a few weeks before. I used a scooter. I was encouraged to do so by Cast Members. Just because you need one to get around at a theme park does not mean you would qualify for one through the DMV. If someone is having trouble getting around, Disney will rent them a scooter to encourage their enjoyment of the park. This isn’t criminal, its just helpful. So, if at the beginning of our trip we are three people when we get our son’s DAS, then our daughter joins us two days later for the rest of our stay, do we just go back to Guest Services to update the number in our party? And then later on, we will be joined by two more folks, update at that time as well? No clue. You’ll need to ask Guest Services when you sign up. Steps are clearly outlined. Do them in order and you’ll be fine. Astro actually does offer DAS even though it is not a FP+ attraction. And they will be using the same tech that the FP+ rides do for the electronic DAS. Thanks. I’ll check that next week. So what you are saying is all of the party members magic bands will reflect that they are tied to a DAS? That’s how anyone is able to get the initial time? Unless there is a way to select who is riding with who from the MDE family and friends list, this would really limit our flexibility since we are a group of 9 traveling with grandma, and cousins as well. The paper DAS worked great on our trip last year and we had no problems when we split up. Our family will have the same problem. The way to solve it is to list all members of the group (up to 12) on both passes, but only a max of 6 could enter with the named DAS person. But, it’s not my call. Sorry, you can’t solve it that way. Each person can only be listed in one DAS ‘group’. If you go to WDW with more than one person with a DAS, make sure you THINK HARD about who rides with each person the most and load up the ‘groups’ that way. If you want to do a ride in a different combination then you need to use the fastpass system instead. Not that I’m aware of. The DAS user must be in the riding group though. You’d need two separate DAS users and two separate touring groups. Where did you get this information? I don’t see any official press releases or DAS updates since November 2014. I never provide confidential sources. Are we able to verify if a change has been made from 10 min to 20 Minutes for immediate access? I called and asked and they said no due hippa laws but you will have to fill out forms is what they told me. We didn’t really have to complete a form. The lady asked us a few questions and took their photos. They try to push you away from using the system by telling you they offer wheelchair access. So if you register at your first park it is good for the duration of your stay at every park? I will nkt need to register at the next park. This will be so mich easier. Yes, but the current system is valid at multiple parks as well. Current system expires after a week though. What if you have 2 children with Autism? I have in the past gotten 2 DAS cards as my husband and I will sometimes take one to a different park than the other. Talk to CM about splitting your group. I have the same situation – 2 kids with a DAS each. You have to nominate a ‘group’ for each child so you (as in our case) will need to put one parent on each childs DAS. However, each parent can only be in one group so make sure you link the child with the parent that they ride with the most. If you want to switch which parent goes with each child on a particular day, you will need to use the fastpass system instead. Any Idea how we could make this work with our large family? We have 6 kids, including our teenage son on the autism spectrum, plus mom, dad and Grandma both in wheelchairs with mobility issues. It is very difficult for us to spilt up, but I haven’t been able to find a solution. Splitting up would require getting your DAS assigned in groups somehow. Ask the CM at Guest Relations. You absolutely don’t need any documentation – Disney takes you at your word (and besides its not really legal for them to ask). Disney is great for kids with autism, and you’ll find that there are lots of ways for you to make it work and have a magical time! (we’ve been a lot with our sensory sensitive daughter and her three brothers. Good luck! And you’ll totally have a great time. Disney is awesome at making families with special needs feel relaxed. How will this work for attractions that don’t currently have a FastPass+ option such as Astro Orbitor? Astro doesn’t offer DAS. You can ask if they offer alternate entrance. All guests have to take the elevator though. My son had a DAS, the cast member took us to a separate entrance and we got on the elevator without having to wait in line. I love that there’s no end time on the return window. That way you don’t lose it if something unexpected happens. This seems like an excellent solution. How does this affect people with mobility issues? Those generally don’t currently get a DAS, but do get alternative boarding on a few rides. It doesn’t affect. The rides with alternate boarding are detailed on my Attractions section. Do we need any sort of documentation to prove the disability? We will be travelling in May with our adult son with autism. We’re travelling without his younger siblings so that he can enjoy his trip fully without the uncertainty that goes along with excited 10 and 12 year olds. He can become overwhelmed in crowds especially when there are younger kids who can be unpredictable. I wonder how this would work if 2 member of the family have a DAS. What if the party splits up some of the time. Would the system allow users to choose which family members are riding with which DAS member? Interesting thought. Seems like the system would keep you all together, so you’d need two distinct touring groups to separate. This was a very clear explanation of the new system. Thanks! Step 1 – do all members of the party need to appear at Guest Services to be added to the DAS as a participating member? If not, how will a member of the party (not the person holding the DAS) be able to complete Step 2? If the wait time is under ten minutes, will they be allowed to ride immediately even if there’s a small line? Yes, the current system allows immediate boarding at 20 minutes or less. Hopefully the time change to 20 minutes will be better.